“And as they were eating, Jesus took bread, and blessed and broke it, and gave it to them and said, ‘Take, this is my Body.’ And He took a cup, and when He had given thanks He gave it to them, and they all drank of it. And He said to them, ‘This is my blood of the covenant, which is poured out for many'” (Mark 14:22-24). 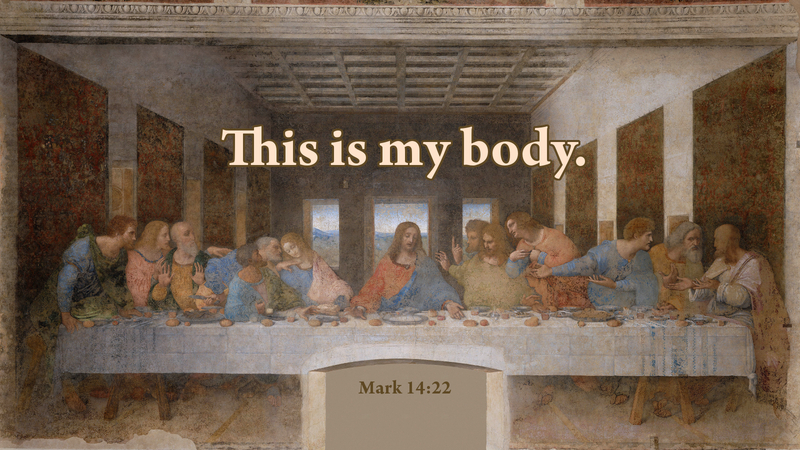 Finally, after many weeks of Lenten discipline and observance, we arrive at the Upper Room, where Jesus institutes the Last Supper. How wonderful that the meal Jesus shared with His disciples that night so long ago, we continue to share with Him today. The word that is used to describe and explain this reality is anamnesis. It is most often translated as “remembrance,” as in “Do this for the remembrance of me.” It might be better for us to leave the original word, “Do this for the anamnesis of me,” because no English word translates it accurately. It means, in “doing this,” Jesus is re-actualized among us, re-presented among us as the Risen Lord, offering Himself to us in the bread and wine which become His real, true, actual Body and Blood. Prayer: Almighty God, in the Lord’s Supper, grant that we may know you, the only true God, and Jesus Christ whom thou hast sent, that we may have eternal life; through the same Jesus Christ our Lord. Amen.